Oh my god, this darling, beautiful, upsettingly lovely book, how do I even begin to talk about it? 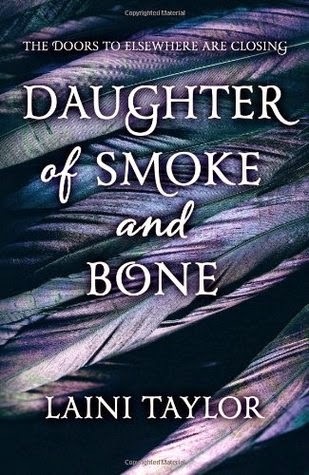 Daughter of Smoke and Bone is a story about family and love, about war and pain and hatred. It's a story about magic, but most of all it's a story about hope – hope that is stronger than any magic. I could give this book all the stars in the world and it still wouldn't quite express how much I was just enthralled, held tight in the sweet embrace of this gorgeous book for one delightful afternoon. I cried, I laughed, I melted. It's taking every last drop of my self-control not to drop everything and read the sequel immediately. I'd read about all the hype for this trilogy. I'd heard that it would be good. But I just wasn't expecting this. This: this lush and evocative writing style, this richly imaginative world. The prose in this book! I could kiss this prose. The language, the word choice... achingly beautiful. Every word is full of splendour and worth lingering upon. I want to go to sleep caressed by a blanket of this prose. It's just SO GOOD. The plot was, admittedly, predictable. But the story is just so wonderfully fleshed-out that I don't care if I saw what was coming all along. I just luxuriated in the journey, in getting to know the characters, Karou above all. Karou and the mystery of her origin. Karou and her family of kind monsters. Karou and her talent for art, her deadly self-defence skills, her wonderfully funny and supportive friend Zuzana, her arrogant ex-boyfriend Kaz. Karou and her emptiness, her longing, her capacity for hope and love. Karou and Akiva, the angel with wings of fire and eyes of molten gold. I have to say, when you reduce the story of their love to a simple outline, it sounds clichéd and worn. I'd be sceptical too. It's very insta-love and almost Twilight-esque in bits. He kind of follows her around for a bit and then watches her sleep. But the book wove for me so perfectly the tapestry of their feelings for each other that I just fell hopelessly for the two of them and the powerful connection that they felt – astral, as the book describes it at one point. Their astral connection. I was simply left breathless by the heat between them, and as their story unfolded and Karou began to discover who she really was, I was entranced. I hurt for them and cried for them. Honestly, I was just so dazzled and carried away by the prose and the love story between Karou and Akiva that I can't think of anything negative to say about this book at all. I loved it with my whole heart, and I will read the sequel very soon, I think. I do not have the power within me to resist for long. I'm glad you enjoyed the book despite it being predictable. Will be reading the book soon! Great review! I hope you enjoy it! I just really fell for this particular brand of prose; it's so dream-like and atmospheric. This author could write anything as long as it's in this writing style and I'd read it. Now I'm really excited to read the book! Hope you will be reading the sequel soon. Will be keeping a lookout for your review! Ok granted you rated it five stars but hey your comparison to Twilight kind of scares me haha. I still just bought the whole set! PS - I crochet too! I adore crochet amigurumi! What other little critters do you make? do you instagram? I put some of the ones I make up there. I didn't make my jellyfish, sadly! There's a link to the Etsy shop which my boyfriend got them from on my About Me page, so I give credit where credit's due. I love amigurumi so much, I just look at cute ones on Etsy all the time and yearn to buy them all, but I think I would probably be terrible at crochet myself, since the one time I tried knitting was disastrous. It's been aaaaaages since I read Twilight but I mean, the whole "watching her sleep" thing just stood out to me, I guess. But it's much better written than Twilight. God, the language in this book makes me swoon. And the insta-love sort of has a reasonable explanation. Sort of. Also Karou can take care of herself a lot better than Bella can. It's good, I promise! I hope you enjoy it. I know, right? All the hype! I was so worried I would be disappointed, but I really wasn't at all. In fact it exceeded my expectations. You rarely enjoy YA fantasy? o: Why is that, do you think? I practically live for YA fantasy, it's definitely my favourite subgenre within YA, so it really surprises me to hear that! Ah, well. Daughter of Smoke and Bone is pretty urban fantasy, so. (I mean, it takes place half in our world and half not, and when it does take place in our world, it's very much set in interesting cities like Prague and Marrakech.) You might enjoy it! Ahhhhhh. I've got so many other books to read, what with my MHAM schedule and the ARCs I downloaded, it looks like I won't be getting round to the sequel until at least next month, but I lent the first book to my friend two weeks ago and she's now already read the second book BEFORE I HAVE. >:( I wanna read the sequel now, dammit. I'M SO EXCITED FOR IT.